Click here to view them larger. Click here to view the backs. Two Cartes de Visite (CDVs), each measuring approx. 2.5 x 4 inches. The photographer on the left is George Amos of Dover, England. The photographer on the right is Elliott & Fry of London, England. Otherwise no identifying information. While debating whether to post either of these photos, I decided they were interesting to compare and contrast, so I’m posting them together. I noticed that, for me, the similarities (the similar angle of the pose, the similar cropping of the image, the elaborate hairdos, and the four strands of beads) stand out for me sooner than the differences (closed collar vs. open neckline, simple strands vs. a strand with a pendant, etc.) On the left, she has pins in her hair that are similar to (if not precisely matching) her earrings, and you can clearly see a net in her hair. On the right, her elaborate pin is on the top of her head, with ribbons down the back. It seems that so much work went into both looks! As for the photographers, information on Elliott & Fry can be found here. And then there’s George Amos, the photographer on the left. There is information on him here. (It’s interesting to browse down that page and see how many photographers were apparently clustered around that same few blocks of Snargate Street.) Apparently George Amos started as a tobacconist and added photography services to his store, before his photography business became quite successful. He eventually turned it over to his son Eugene, at which point the business was called Amos & Amos, so this is before that time. I noted (as you can see on the back), that Amos was “Under the Patronage of H.R.H. The Duchess of Cambridge”. Since today’s Duchess of Cambridge is the former Kate Middleton, I wondered who the Duchess of Cambridge might have been in those days. It’s a little complicated, and I may have it all wrong, but apparently the Duke of Cambridge at the time had gone against his family’s wishes and married a commoner, not only the daughter of a servant, but (horrors!) an actress. This marriage was technically not recognized by law, so the Duke’s wife was not the Duchess. The person calling herself Duchess at the time was the Duke’s mother. 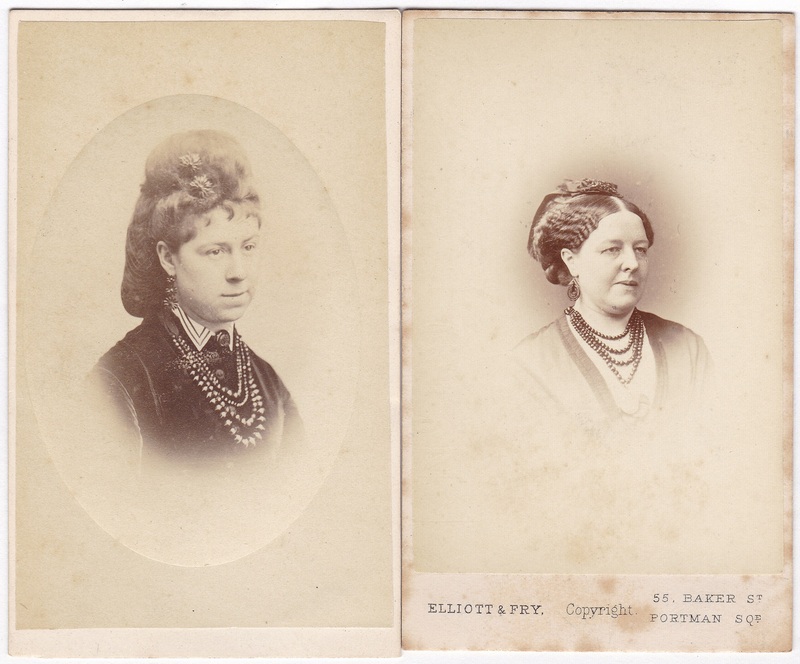 Since I believe the Duchess’s patronage would have ended with her death in 1889, I think we can assume the photo on the left is from no later than 1889. Two very nice photos. I’d agree with your timing of the left hand image. The one on the right has an almost Edwardian feel to it. That may be due to British and European fashions being ahead of the curve. Thanks, Mrs. Marvel. I know what you mean about the one on the right. It somehow looks more sleekly sophisticated to my eye than the one on the left. I could easily have been wrong in labeling it Victorian. So I just looked further at the photography studio’s information for clues. Wikipedia says they were at that address until 1919, but the British National Portrait Gallery (which has a lot of examples of their work online, by the way) says they were at that address only until 1886, though another source says 1886 is just when they expanded from 55 Baker Street to 55-56 Baker Street. 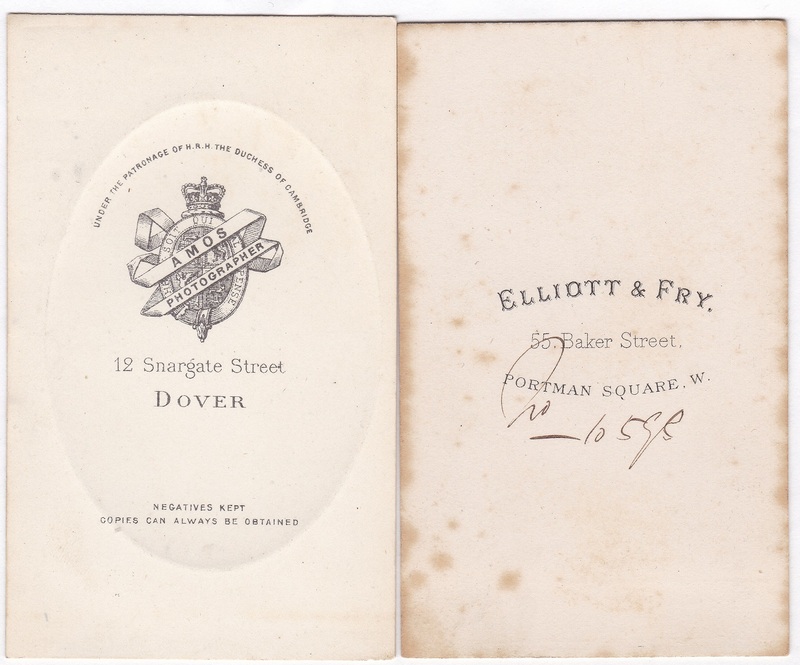 Another source says they became “Elliott & Fry Ltd.” (adding the “Ltd.”) in 1911, so the photo is apparently from earlier than that. It’s sometimes hard to piece it all together! Is the card itself a CDV sized? That fell out of popularity around 1899-1900 so that may be helpful with dating as well. I have an art print dated to 1898 that looks decidedly Edwardian. I think the fashion houses were just as forward then as they are now. Maybe this lady was on the leading edge as well. Yes, they are both the smaller CDV size, not the larger cabinet card size. That’s part of what made me assume they were from the Victorian era, rather than later, though I know such general assumptions can be faulty.